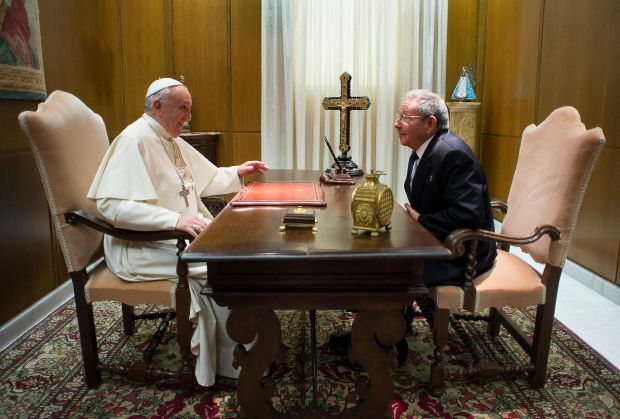 VATICAN CITY (CNS) — After spending close to an hour with Pope Francis, Cuban President Raul Castro told reporters he is so impressed by what the pope does and says that he might start praying and could even return to the church. “I had a very agreeable meeting this morning with Pope Francis. He is a Jesuit, as you well know. I am, too, in a certain sense because I was always in Jesuit schools,” Castro told reporters May 10. 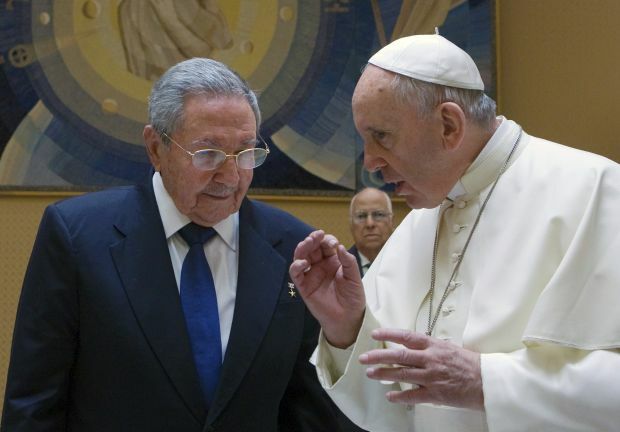 “When the pope comes to Cuba in September, I promise to go to all his Masses and will do so happily,” the president told reporters at a news conference he held later in the day with Italian Prime Minister Matteo Renzi. Today, he said, the country allows people to hold important positions even if they are not members of the party. “It’s a step forward,” he said, although many of the reforms he would like to make are still being implemented. 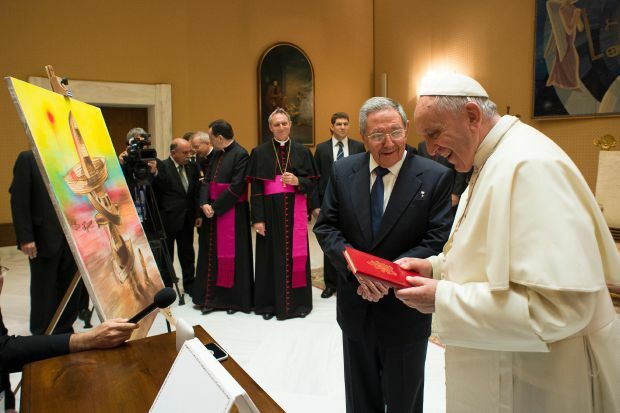 During the traditional exchange of gifts, Castro gave Pope Francis a commemorative medal featuring Havana’s cathedral and, in honor of Pope Francis’ concern for migrants, a contemporary painting of a cross made up of migrants’ boats with a migrant kneeling before it in prayer. The Cuban artist known as Kcho, who made the painting, was present at the audience and told Pope Francis he was inspired by the pope’s expressions of concern for the thousands of migrants who risk their lives crossing the Mediterranean Sea seeking security and a better life in Europe. Maybe he can bring back the thousands who he and his brother killed and jailed, oops too late for that.